Our friends at Koprince Law, LLC have published two articles about this change, providing details on how the size status under revenue-based NAICS codes will now be calculated using a five-year average instead of the longstanding three-year average. As they point out, for some contractors, the new law is great news, as it will allow them to stay small longer. For others, the opposite is true: the law could force those companies to stay large longer, or even change their self-certifications from “small” to “other than small” in SAM. SBA’s OHA clarifies negative control restrictions – But do the new SDVOSB regulations limit its impact? 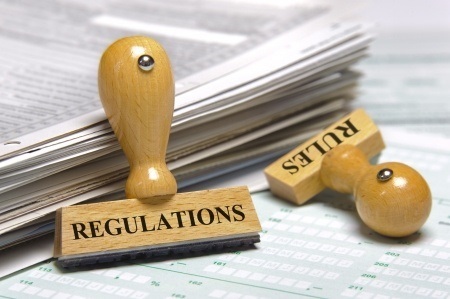 Between new regulations from the Small Business Administration (SBA) and decisions from the SBA’s Office of Hearings and Appeals (OHA), the limits of acceptable actions by small business owners set on maintaining their small business size status continues to change. Most recently, OHA issued a noteworthy decision that clarifies restrictions on negative control of small businesses, including what actions it considers “extraordinary actions” and what actions are ordinary actions related to the daily control of a company. 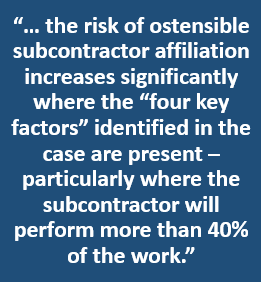 OHA’s decision in Size Appeal of Southern Contracting Solutions III, LLC, SBA No. SIZ-5956 (2018) is helpful in understanding the parameters of permissible negative control since OHA provided its clearest list to date of “extraordinary actions” and “ordinary” actions essential to the daily operation of the company. However, it is important to note that the impact of the ruling, as far as service-disabled veteran-owned small businesses (SDVOSBs), will be limited in light of the new SBA and VA regulations. Click image above to open SBA’s Size Standards table. As the incumbent contractor, you’re excited to bid on the successor contract. The day it’s posted, you dash to fbo.gov, pull up the solicitation, and breathe a sigh of relief: the contract is still exclusively a small business set-aside. But wait! Under the assigned NAICS code your business doesn’t fall below the size standard. Can the agency change the NAICS code from one iteration of the contract to another? Sure, so long as the selected NAICS code meets the regulatory standard. In NAICS Appeal of STG, Inc., SBA No. NAICS-5936 (2018), OHA considered a solicitation, issued by the Department of the Army, for “[n]on-personal information technology (IT) services and support requirements.” The contracting officer assigned the procurement NAICS code 541513, Computer Facilities Management Services, which carries a $27.5 million size standard. STG, the incumbent contractor, disagreed with that selection. It contended that the NAICS code, assigned to the existing contract, was the correct one, namely NAICS code, 517110 (now NAICS code 517311), Wired Telecommunications Carriers, with a 1,500-employee size standard. 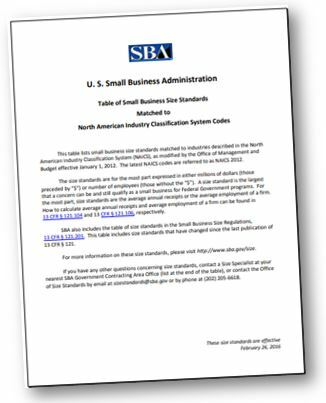 This is a Checklist for existing or prospective federal government contractors to determine whether they can meet the definition of a small business concern (SBC) under the Small Business Act (SBA). 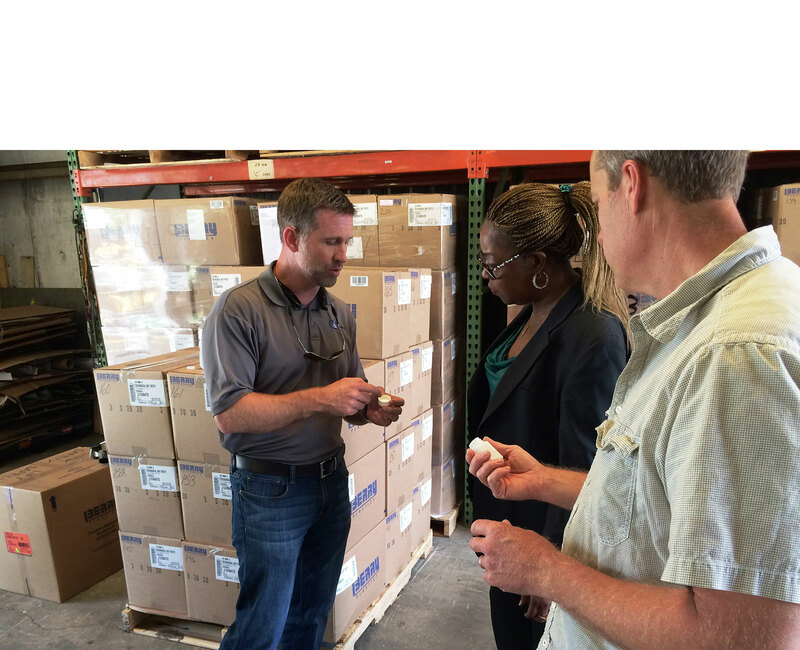 This Checklist includes the definitional thresholds and size standards for SBCs. a Historically Underutilized Business Zone (HUBZone) SBC. In commentary published in the Federal Register on April 27th, the SBA rejected (among other things) recommendations that it use average employee count to evaluate the sizes of construction firms and that other firms’ sizes be measured by profits or net worth instead of average annual receipts. 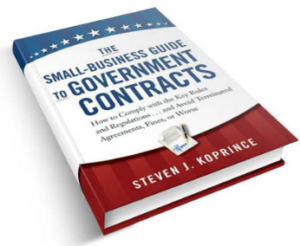 The federal government sets aside many contracts for small businesses, but not all small business set-asides are created equal. Instead, different size standards define small business status for different procurements. The size standards vary from industry to industry, so a given firm may be a small business for one procurement at the same time it may be other-than-small for a different procurement for seemingly similar goods or services. For each procurement in excess of the micro-purchase threshold (currently $3,500 for most acquisitions), the contracting officer, per FAR 19.303, must designate within the solicitation a single NAICS code that best corresponds to the goods or services the agency is soliciting. The chosen NAICS code establishes the size standard for that procurement. If the procurement is a small business set-aside, the size standard can determine (in large part) whether a particular offeror is eligible for award. OHA’s decision in Size Appeal of Gregory Landscape Services, Inc., SBA No. SIZ-5817 (2017) involved an Army solicitation seeking grounds maintenance at Fort Rucker, Alabama. The solicitation was issued as a WOSB set-aside under NAICS code 561730 (Landscaping Services), with a corresponding $7.5 million size standard. After opening bids, the Air Force announced that Gregory Landscaping Services, Inc. was the apparent awardee. An unsuccessful competitor then filed a size protest. Although the size protest was untimely, the SBA saw potential merit to the protester’s allegations. The SBA adopted the size protest and initiated a size determination.